Shop Rode NT55-MP Matched Pair Condenser Instrument Microphones from AMS with 0% Interest Payment Plans and Free Shipping. 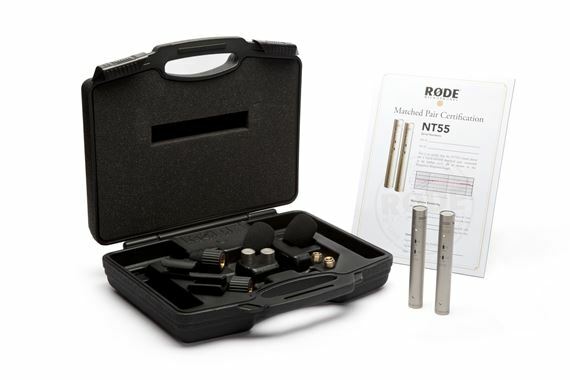 The Rode NT55-MP Matched Pair Condenser Instrument Microphones utilize the 1/2-inch gold sputtered true condenser transducer used in the renowned Rode NT5. The NT55 Matched Pair have been acoustically matched to provide only the finest in recording quality and consistency. These low-noise, balanced output microphones exhibit a wide dynamic range and full frequency response. The Rode NT55 circuit incorporates a three position variable PAD with 0dB, -10dB or 20dB attenuation, and a three position variable high-pass filter that enables you to step from a flat response to 75 or 150 Hz high pass filter. The Rode NT55 mics come with two different condenser microphone heads to provide a wide variety of polar patterns. The NT55 is complemented with a diverse range of accessories to better facilitate positioning and attachment.